The artists James Brooks and Charlotte Park were among the earliest notable participants in the Abstract Expressionist movement, but when their 11-acre property and studios in Springs was purchased by East Hampton Town last year, the original plan was to knock down their work spaces and turn the property into a preserve. But artists in East Hampton, many of whom knew the couple and were intimately familiar with their work, launched a campaign not long after the town purchased the property to see their studios restored. Last week, East Hampton Town took the first step in that process by designating the buildings a historic landmark, and the town board is planning to hold a second public hearing Aug. 7 to change the purpose of their purchase, through the Community Preservation Fund, from open space preservation to historic preservation. Mr. Brooks was one of the original signers in 1950 of an open letter to the director of the Metropolitan Museum of Art, boycotting the museum’s then-current exhibit “American Painting Today—1950.” At the time, this group was called the Irascibles. They later became known as the Abstract Expressionists. The Montauk studio and guest cottage. The couple first came to the East End after visiting their friends Jackson Pollock and Lee Krasner in Springs in 1948. 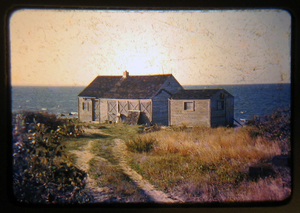 At first, they leased a house and studio overlooking Fort Pond Bay in Montauk, but after the studio was badly damaged by Hurricane Carol in 1954, they moved the cottage by barge to their own property on Neck Path in Springs in 1957. Two years later, Mr. Brooks built a studio on the Neck Path property, and in the early 1970s, Ms. Park had another building, believed to have been the original Wainscott Post Office, brought to the property to be used for her studio. Mr. Brooks died in 1992 and Ms. Park died “peacefully…at the age of ninety-two at her home in East Hampton” on Dec. 26 2010, according to her obituary in The New York Times. At a public hearing on the historic designation before the East Hampton Town Board July 17, many residents shared personal stories of the two artists. Former Town Councilman Job Potter’s father’s marine contracting firm, East Hampton Dredge and Dock, was responsible for moving the house from Montauk to Springs. He said he and attorney and East Hampton natural history expert Rick Whalen had explored the shoreline in Montauk looking for the original site of the house, in an area where he’d heard trap fishermen from the North Fork often spent their summers. Mr. Potter said he believes the Abstract Expressionist movement is perhaps one of the most important things that happened in East Hampton. East Hampton Nature Preserve Committee Chairman Zachary Cohen spent a great deal of time over the past year talking to people in Springs who knew James Brooks and Charlotte Park. “They were not just artists who lived in Springs. They were artists of The Springs,” he said. He read several passages from Ms. Park’s nature journals, which were donated to the South Fork Natural History Museum by her friend, Cile Downs. Martin Drew of Springs, a longtime advocate for recreation areas, particularly for dirt bikes, in town, said he had mixed feelings about the projects. Ira Barocas said he believes the property will become a community resource. Architect John Mullen pointed out several unique features of the buildings that he found to be worth preserving. “When I looked at it as an architect, I said, ‘wow, you can’t tear this down,'” he said. Loring Bulger lives across the street from the property and has been instrumental in making the John Little Studio at Duck Creek Farm in Springs open to the public. The non-profit Brooks-Park Heritage Project is collecting private donations to restore the studios and open them to the public. More information is online here.